Adeli Therapy also known as Therasuit Therapy is suitable for patients with spastic paralysis, Cerebral Paresis and further disorders of movement. The Adeli Therapy originates from space research and, similar to astronauts, patients are fitted with a suit, the so-called Adeli-Suit. The suit stabilises the patient’s posture and extremities and corrects the head and foot posture and other functions, and can be adjusted to meet the patient’s requirements. It is composed of many support and weight elements, shoulder pads and vest, a wide belt , shorts, knee pads and shoes. These parts of the suit are connected with elastic straps. 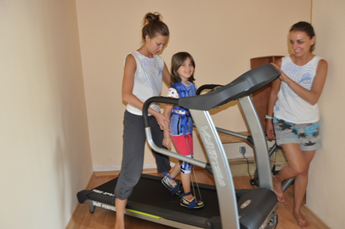 The muscles are stimulated and trained therewith during neuro-physiological exercises. As Adeli Therapy does not require the patient to take medication or have injections, or to undergo any operations, this form of therapy has no side-effects, no element of risk and is not painful. It can be used to treat various different ailments even when they are in an advanced state. Patients who suffer from epilepsy are advised not to try this form of therapy. Through moving with the suit, impulses that are transmitted to the brain are corrected and normalised. This affects the central nervous system, co-ordination and speech ability. Here disturbed functions can be reanimated which also remain after the end of the therapy. As Adeli Therapy is not so common in Europe as opposed to the rest of the world, with the addition of this form of therapy to our programme we want to make it available to a wider spectrum of people who need therapy in Europe. The addition of this form of therapy to our Therapy Package does not increase the price. It was a great and successful time that we got to spend with you. Sandra has lost her anxiety and rushing. Her concentration is so much better, that she stays and sits at the table, draws longer and more precise, plays board games till the end. She has also made huge improvements with her language. We are very happy to have done the therapy. Book now with anniversary special prices! To celebrate our 12th Anniversary, we would like to thank you with an Anniversary Special. 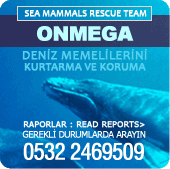 Come to Marmaris: Swimmimg with dolphins for the whole family. Our swimming seawater-dolphinbasin is opened the whole year. Just take a break from it all, relax and do something for yourself. It doesn't take a lot of your time, it is intense, enjoyable and relaxing. Let yourself be spoiled by the angels of the ocean and indulge in wellness and beauty programs, steam bath and other amenities.